The Chase Sapphire Preferred Card offers valuable rewards for frequent travelers, as well as the potential for savvy rewards card users to glean some extra value out of their rewards. If you are a frequent traveler, the Chase Sapphire Preferred is one of the best cards of its class – offering extensive travel perks and one of the most valuable sign-up offers available. A flashy metal card design combined with a lucrative rewards rate and flexible redemption options make it easy to see the card’s value. One of the most eye-catching features of the Chase Sapphire Preferred card is its sign-up bonus – currently 60,000 points for spending $4,000 in the first three months. Since points are worth 1.25 cents when redeemed for travel through the Ultimate Rewards portal, this comes out to $750 in travel purchases. That’s enough for a few round-trip flights on its own, before the rewards you earn from spending $4,000. Among travel cards with a $95 annual fee, the Chase Sapphire Preferred’s sign-up bonus offers one of the highest values you can find. The rewards rate on the Chase Sapphire Preferred is designed with travelers in mind, offering 2 points per dollar on both restaurant and travel purchases. You’ll also earn 1 point per dollar on general purchases. If you are hoping to fast-track your way to your next trip, Chase offers even more ways to rack up Ultimate Rewards points. One way to earn a few extra points is by taking advantage of Chase’s referral bonus policy. You can earn up to 50,000 Ultimate Rewards points per year by referring a friend for the Sapphire Preferred (10,000 points per approval). Tip: Since Chase allows cardholders within the same household to transfer points to one another’s accounts, you and your spouse can both sign up for the Sapphire Preferred card, collect the sign-up bonuses and combine them. If you refer your spouse to the card, you can also collect a referral bonus. Chase also offers its own shopping portal, called Shop Through Chase, which allows cardholders to earn between 1 and 5 bonus points (in addition to regular rewards) just for shopping with their favorite online retailers through a special link. What are Chase Sapphire Preferred points worth? Probably the most lucrative feature of the Chase Sapphire Preferred cards is the 25 percent bonus for redeeming points for travel in the Ultimate Rewards portal. This boosts the potential value of your points to 1.25 cents. Even if you choose another redemption option, Ultimate Rewards points are still some of the most valuable card rewards around. The Chase Sapphire Preferred card rates high on the flexibility of redeeming rewards. Redeeming points on your Chase Sapphire Preferred account is easy, and you have several different options. On the Ultimate Rewards portal, you can see your current account balance and all the different ways to use your points. Ultimate Rewards points can be redeemed for anything from travel purchases to gift cards. However, the value does fluctuate depending on how you choose to redeem your points. The Chase Sapphire Preferred offers some of the most valuable point redemption options you can find, due mostly to its boost on travel redemptions. Plus, unlike many other points-based cards, you still get 1 cent per point when choosing to redeem for a statement credit. This vastly increases the card’s flexibility. If you find a great travel deal on another site, you can still redeem points for cash back to cover the cost. Just be sure to weigh the savings against the additional point value you’d get for booking through Ultimate Rewards. Adding to the Sapphire Preferred card’s flexibility, Chase allows cardholders to transfer their points to several travel partners at a 1:1 ratio. Since many airline and hotel points are worth more than 1 cent per point, you can use this option to stretch your rewards even further. While several other rewards programs, including American Express and Capital One also offer the ability to transfer points, we think that Chase offers the best list of partners, including three major U.S. airlines, and some very valuable airline partners abroad. If you are a frequent flyer of Singapore Airlines, Iberia, JetBlue or United, transferring your points to the airline program makes them more valuable than if you book through Ultimate Rewards. With several major airlines on this list, you can stretch your points further for travel to all sorts of destinations. The Chase Sapphire Preferred also comes with a slew of travel and purchase protections and benefits, including primary car rental coverage, that can save cardholders a lot of money if used strategically. No foreign transaction fees – As an added benefit for travelers, the card doesn’t charge a foreign transaction fee. This can save you hundreds on an international vacation. Trip cancellation/interruption insurance – If you need to cut a trip short or cancel because of an illness or severe weather, Chase will reimburse you up to $10,000 per person ($20,000 per trip) for prepaid, non-refundable travel expenses. Auto rental collision damage waiver– Simply waive the rental provider’s coverage and pay in full with your Chase Sapphire Preferred card to receive primary coverage up to the cash value of the vehicle for theft and collision damage both in the U.S. and abroad. Baggage delay insurance – If your bag is delayed more than six hours while you travel, you can be reimbursed for essentials up to $100 a day for five days. Purchase protection – Qualifying purchases on your card are covered for 120 days against accidental damage or theft (up to $500 per claim, $50,000 per account). Extended warranty protection – On warranties of three years or less, you can extend the manufacturer warranty on eligible purchases by an additional year. Tip: The Sapphire Preferred card’s car rental coverage may save you time and hassle if you use the card to rent a car. Since the coverage is primary, it will kick in regardless of whether you have coverage through another policy, saving you from having to file a claim through your insurance. Chase has a fairly good customer service record, scoring an 804 on J.D. Power’s 2018 customer satisfaction survey (fourth out of major issuers). The Chase app also has good reviews, rating 4.6 out of 5 in the Google Play Store and 4.8 out of 5 in the Apple App Store. Unfortunately, Chase doesn’t include a chat feature on its website – making it a bit more difficult to get quick answers to simple questions. In addition to a top-rated banking app, Chase offers its own mobile wallet – Chase Pay. The number of retailers that accept the payment method is limited, but it is a plus for cardholders who prefer digital payment solutions. Another major advantage of the Chase Sapphire Preferred card is that Chase offers a suite of Ultimate Rewards cards that you can pair with it to boost your rewards earnings. For example, the Chase Freedom® offers 5 percent cash back on rotating bonus categories that you activate each quarter (up to $1,500 per quarter). The Chase Freedom Unlimited® offers 1.5 percent cash back on every purchase. All of the rewards that you earn with these cards, including their sign-up bonuses, can be transferred as points to the Sapphire Preferred card. If you use the Freedom Unlimited for general purchases, the Sapphire Preferred for dining and travel and the Freedom for the rotating bonus category, you earn more points than you would with just one card. The Ultimate Rewards cards compose one of the most valuable card combinations of any major rewards program. If you enjoy juggling cards to maximize rewards, Ultimate Rewards may be the program for you. How does the Sapphire Preferred compare to other travel cards? If you are a frequent traveler trying to maximize your travel rewards, the Chase Sapphire Preferred is one of the best options. However, there are a few other travel cards that compete. The Chase Sapphire Reserve is a more luxury version of the Sapphire Preferred, offering a generous $300 travel credit that can be used to cover anything from airfare to baggage fees. The Reserve also has a higher rewards rate on travel and dining purchases and bigger point boost for travel redemptions. If you spend more than $3,334 on travel and dining per year, these higher values make the Reserve more rewarding – despite a $450 annual fee. Tip: Before you sign up for the Sapphire Preferred card, you should crunch the numbers to make sure the Sapphire Reserve card isn’t the best option for you. Don’t be deterred by the card’s $450 fee. It often turns out to be a better value. While the sign-up bonus on the Venture card isn’t quite as valuable as that of the Chase Sapphire Preferred, it offers a competitive 2 miles per dollar on every purchase – rather than just on dining and travel. For some spenders, this can make up for the lower point value. For example, if you spend $25,900 a year and $8,000 of that is on travel and dining, the earning rate on the Venture card can outpace the Sapphire Preferred – even with a lower point value. 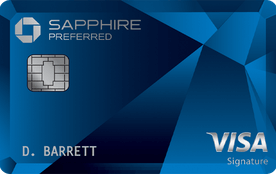 Plus, the Venture card waives its $95 annual fee in the first year, while the Sapphire Preferred does not. The American Express Gold Card offers one of the best rewards rates you can find on U.S. supermarket and restaurant purchases, making it a valuable choice for foodies looking to earn travel rewards. It also offers a $120 dining credit ($10 per month) for select restaurants and a $100 credit for airline fees. Who should apply for the Chase Sapphire Preferred? Cardholders of another Chase Ultimate Rewards cards hoping to maximize points. Cardholders who travel and dine out frequently. Savvy spenders looking to stretch rewards points on a travel redemption. Loyalists of Chase’s travel partners who want to be able to transfer points to another program. Cardholders who are new to the travel rewards game and want to get their foot in the door with a great first travel card. Use your card for all travel and dining purchases to boost points earning. Redeem your points for travel – you will get the best rewards rate for Ultimate Rewards portal travel redemptions and transfer partners. Pair with another Ultimate Rewards card with bonuses in different categories of spending to maximize rewards. Use the card when you rent a car to take advantage of its primary car rental coverage. Is the Chase Sapphire Preferred card worth it? If you travel frequently, the Chase Sapphire Preferred has a lot of potential value – especially in the first year. Though the annual fee is not waived the first year (like with the Capital One Venture card), the introductory offer alone is worth up to $750 in travel purchases. Plus, rewards are easy to earn and redeem. If you are looking for a great entry point into the world of travel rewards, the Sapphire Preferred may be the card for you.